The HT1001P CAMS system was designed from the ground up with manufacturing in mind. With continuous batch production capability, the HT1001P allows intensive manufacturing cycles with little down time between builds. The systems throughput is also enhanced with a high efficiency top-feed system as well as fully digital multi-laser scanning capability. The HT1001P has also been designed with a comprehensive powder handling system featuring a closed loop powder system with increased automation and little need for operator interaction with the powder supply. With the HT1001P the additive industry is ready to take the next steps towards true manufacturing. The HT1001P offers production capabilities for its users beyond the current state of the art. The large 1000x500x450 build area allows for unparalleled production of numerous small parts or that of large parts without the need for joining or gluing. The HT1001P is also capable of a greater temperature range than current SLS systems with build chamber temperature capable of reaching 220°C allowing for the processing of high performance materials such as PA6 and PA12. The HT1001P like all Farsoon systems is fully open. This means that Farsoon machines like other truly industrial manufacturing systems have open parameters as well as an open material model. 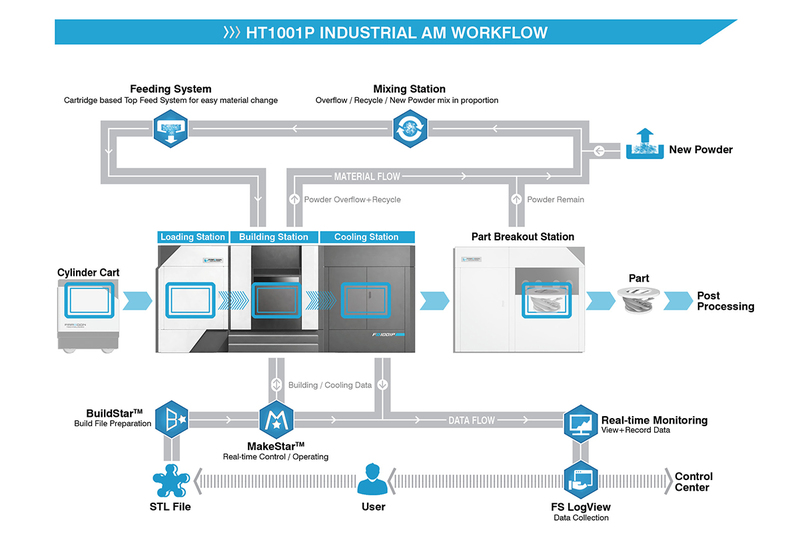 In addition,the HT1001P’s modular design allows for the easy addition of future stations for pre and post processing as well as integration into existing production lines. * Specifications are subject to change base on final configuration.